Growing up, I always looked forward to holiday dinners or special occasions, as they signaled a high likelihood Dad would grill a beef tenderloin. Now I also looked forward to the holiday itself, but for whatever reason, it was the meals I zeroed in on. If it included a 7-pound smoke infused grilled tenderloin, can you blame me? Beef tenderloin is another big meal which can seem daunting to grill but is not. With most meals, time and temperature are key. 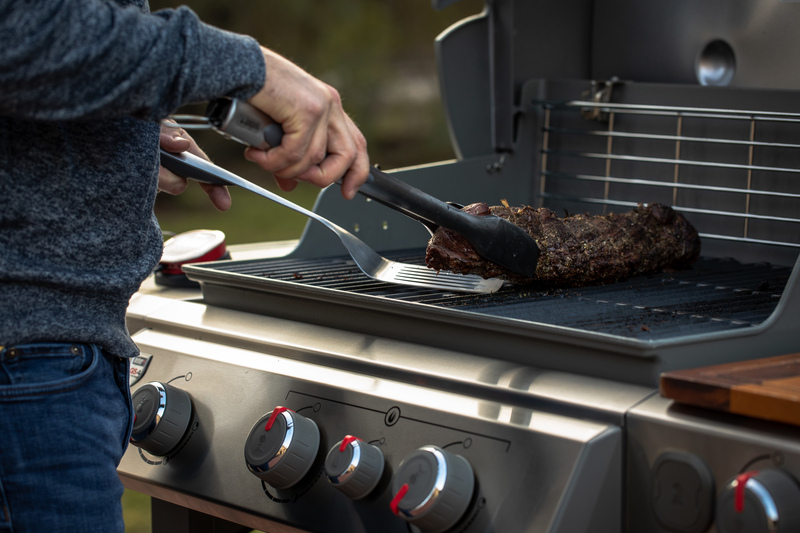 Use time to stay in the ballpark and temperature to remove the meat from the grill at the exact measure of your liking. For me, it’s 125° F and a short rest for a perfect medium rare. While tenderloin is pricey, stretch the dollar by purchasing an untrimmed tenderloin, or PSMO, and break it down at home. PSMOs, or peeled, silverskin, side muscle on, can be found in most shopping clubs and with a sharp knife and a little bit of work, can provide a lot more meat for less money. Plus, I like to play butcher. The tenderloin is a very lean muscle devoid of almost all fat. Its buttery texture is savory on its own, but I find this cut always benefits from a sauce. Thankfully, Jamie Purviance has us covered with just the right recipe. Now when’s the next holiday? I need to give Dad a call. 02 Using a thin knife, trim and discard the excess fat and all of the silver skin from the tenderloin. Remove the long "chain" meat that runs next to the tenderloin and reserve for another meal. Part of the thin “tail” end of the tenderloin may separate as it is trimmed, but leave it connected to the main muscle as much as possible. Lay the tenderloin out flat and straight, with the smoothest side up, aligning the narrow pieces at the tail end. Neatly fold the tail end of the tenderloin under itself to form an even thickness (one end may be larger). Tie the roast snugly with butcher’s twine at 2-inch intervals. Secure the folded end with two strings. Lightly coat the roast with oil. Season the roast all over with the rub. 03 Let the roast stand at room temperature for 30 minutes to 1 hour before grilling. 05 In a large skillet over high heat on the stove, combine the shallot, vinegar, tarragon, and thyme, and cook until the vinegar evaporates, 3 to 4 minutes, stirring often. Add the wine and broth and boil until reduced to about ½ cup, 3 to 4 minutes. Add the cream and boil until the surface is covered with large, shiny bubbles and the sauce is reduced to about 1½ cups, 5 to 7 minutes. Remove from the heat, adjust the seasonings, and set aside. Reheat and add parsley just before serving. 06 Brush the cooking grates clean. Sear the roast over direct medium heat for about 15 minutes, turning a quarter turn once every 3 to 4 minutes. Then slide the roast over indirect medium heat and cook until it reaches your desired doneness, 20 to 30 minutes for medium rare (125º to 130ºF), turning once. Keep the lid closed as much as possible during grilling. Remove from the grill, loosely tent with foil, and let rest for 10 to 15 minutes. The temperature will rise a few degrees during this time. 07 Snip and remove all the twine from the roast. Cut the meat crosswise into ½- to 1-inch slices. Season with salt. Serve warm with the sauce. Beef tenderloin is one of those cuts of beef that you want to come out perfect. This is where the iGrill comes in! 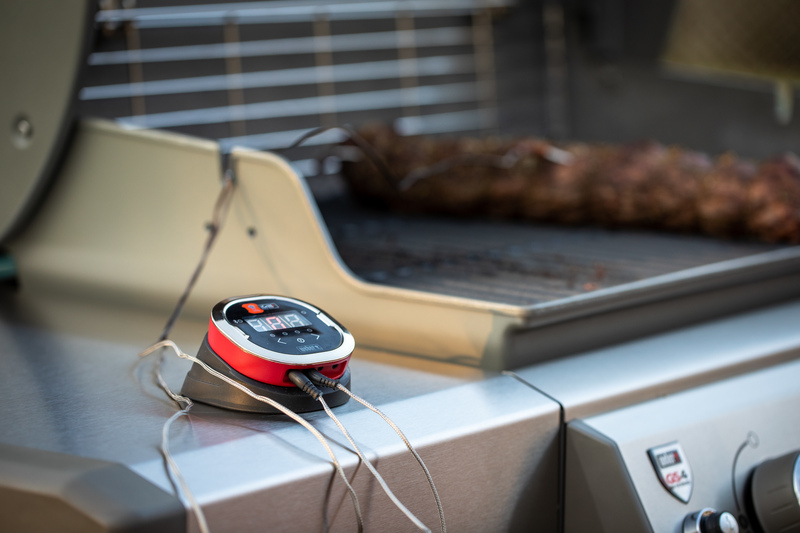 The iGrill is an app-connected thermometer that will send alerts right to your phone about the internal doneness of the tenderloin, so that you don't under or worse- over cook it. 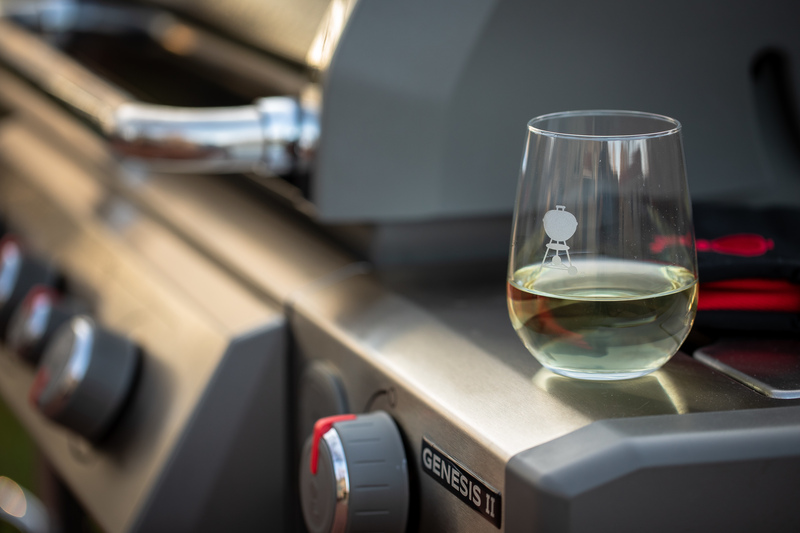 Essential for moving your food on and off the grill with ease. 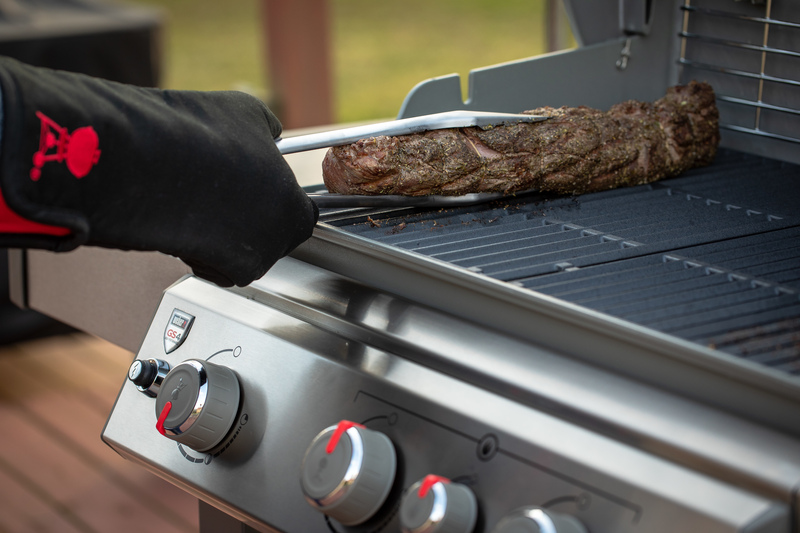 The Weber Barbecue Mitt keeps your hand and forearm safe from the heat of your grill and is a necessity while grilling up any delicious dish. Set your holiday table with this set of etched kettle wine glasses.